Over the past few months, several members of the quilt guild have been working together to create a quilt for the 2012 Silent Auction that is part of Relay for Life. Relay for Life starts at dusk and ends at the next day’s morning. The light and darkness of the day and night parallel the physical effects, emotion, and mental state of a cancer patient while undergoing treatment. The Relay begins when the sun is setting. This symbolizes the time that the person has been diagnosed as having cancer. The day is getting darker and this represents the cancer patient’s state of mind as they feel that their life is coming to an end. As the evening goes on it gets colder and darker, just as the emotions of the cancer patient does. Around 1:00 a.m. to 2:00 a.m. represents the time when the cancer patient starts treatment. They become exhausted, some sick, not wanting to go on, possibly wanting to give up. As a participant, you have been walking and feel much the same way. You are tired, want to sleep, maybe even want to go home, but you cannot stop or give up. 4:00 a.m. to 5:00 a.m. symbolizes the coming of the end of treatment for the cancer patient. Once again they are tired, but they know they will make it. The sun rising represents the end of treatment for the cancer patient. They see the light at the end of the tunnel and know that life will go on. The morning light brings on a new day full of life and excitement for new beginnings for the cancer patient. 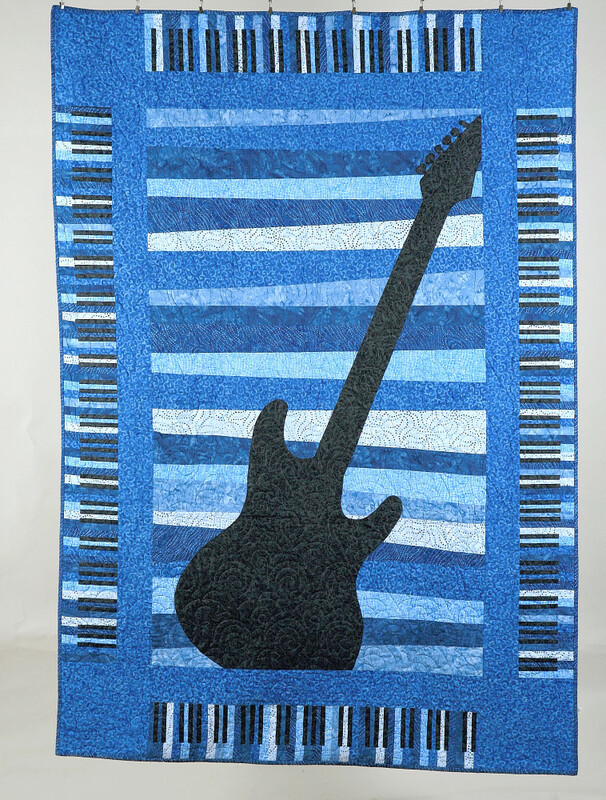 Guild members made monochromatic blocks in shades of orange, green, cream and brown and those were nestled in to a light blue background for the quilt top. Heather Grant gave us a mini lesson on using negative space in modern quilt layouts at one of our monthly meetings. The quilt back is pieced together using the color palette from the front of the quilt, and includes two more donated blocks. The Silent Auction will be held Sunday, April 1st 5:30pm - 8:30pm. The entire community is invited to join us at Playland Skate Center, located at 8822 McCann Dr. There will be roller skating, food and drinks for sale, and many wonderful items up for auction. All of your donations help the American Cancer Society in their quest to create a world with less cancer and more birthdays. Join us for our monthly meeting, which will be held Thursday, April 12th from 6:30-9:00pm @ Remnants: Fiber Culture (10435 Burnet Road, Suite 106) in North Austin. There will be no show-and-tell this month so we can get right down to business with a special paper "piece-a-long" facilitated by talented modern quilter and guild member Heather Scrimsher (more details below). Also, don't forget to bring your Color Wheel Swap Blocks. Please put them in a ziplock bag labeled with your name. The Austin Modern Quilt Guild is offering a "piece-a-long" at our April meeting facilitated by Heather Scrimsher of Fiberosity. We will have machines set up with grey, black and white thread so you can try paper piecing with someone there to help you if you get stuck or even don't know how to get started! Paper piecing is super easy and once you have the basics, you can do any pattern out there. Even if you are an experienced paper piecer, please feel free to join us. There might even be a prize....come join in for details! So why would you even want to do paper piecing (sometimes called foundation piecing)? It gives you amazing shapes and the ability to do what seems to be impossible shapes in your quilts. 4 copies of the "circle of geese" pattern by PieceByNumber (please note that there is a clockwise AND counterclockwise pattern, you need to have 4 copies of the same direction, i.e. not 2 clockwise and 2 counterclockwise). There are printing instructions and paper piecing paper is nice to use. Most quilt stores and even JoAnns carries printer size paper for this. 12 fabric scraps each 2.5"x5" for the geese. Excellent for jelly roll ends or 1/2 charm square. 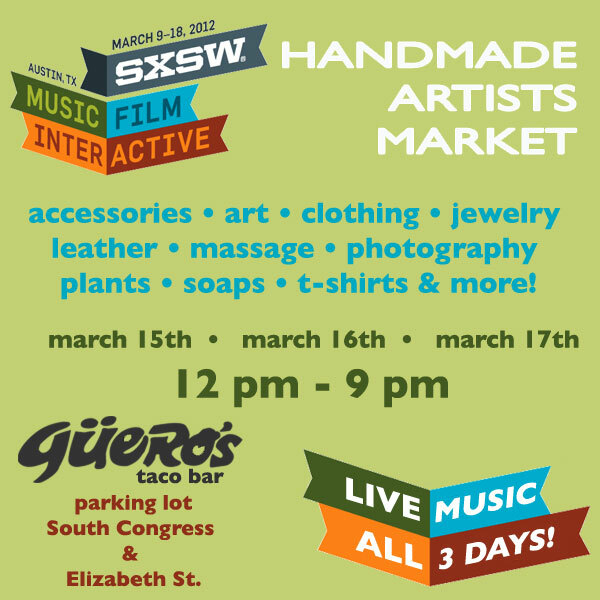 Everyone wants a piece of the SXSW action, including textile artists, craftsters, and sewists! Because it's hard to find events in all the noise, and many things pop up all last minute and unofficial, we decided to keep a running list here on our blog. Please post any sewing/crafts/textile arts events you know of in the comments below, and we'll update this post with them every day. What's on the list so far? 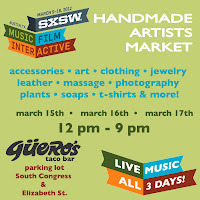 SXSW Handmade Artists Market. Our own Special Events Coordinator, Jessica Pierre-Auguste will be selling there on Saturday March 17th. Event is at Gueros, on the corner of South Congress and Elizabeth Street. Bernina Make and Take event, March 16th and 17th, noon - 8 PM, at the Austin Convention Center as part of the free Style X Showcase. They will be in Booth 315. The Style X show looks really freaking cool! If you try to find an official Bernina press release on this one, good luck. The Benina store at Parmer & Whitestone in Cedar Park didn't have a clue about it, either, but looks like Sew Much More on Anderson Lane is sponsoring it. More info on Bernina's booth here. WonderCraft is going graffitti-style, overspraying t-shirts, bags, and other stuff with grungy SXSW stencils. More info here. Rumor is that Etsy Austin/CraftRiot is keeping it low-key this year. Added 3/11: One of our guild members says: "Flatstock is awesome. This is one of my favorite SXSW events every year." http://sxsw.com/music/expos/flatstock Looking at photos on the link, I'm already inspired with some new quilt ideas! Know of any other SXSW sewing/crafts/textile-related events? Share them in the comments below. The Austin Modern Quilt Guild is growing exponentially! As we evolve into a bigger, more well-known guild, we are working hard to develop a strong foundation that serves the interests of all our members. Our Planning Committee is tackling bylaws, membership fees, future officer/committee structure, meeting spaces and more. Joining the Planning Committee requires a four month commitment to attend 1-2 meetings a month, outside of the regular monthly guild meetings. There's also work to be done between meetings - this month, we're looking at other modern guilds' structures and bylaws for ideas as we develop our own. What's in it for you? You'll learn more about our history, and can shape the future direction of our guild. You'll get to know current officers and guild founders better. Maybe you'll even find a position that interests you for the upcoming year. Most importantly, you'll be blessed with good quilting karma. Interested? Our next meeting is Sunday, March 25th, 3-5 PM at the Cherrywood Coffeehouse. Email planning (at) austinmodernquiltguild.com for more details. This is the third month of our six month block swap. You can read about the details of the swap by clicking on the Intro link in the 2012 Block Swap list on the right side of the page. Faith of Fresh Lemon Quilts has written a paper piecing tutorial for the Star, you can find it here. 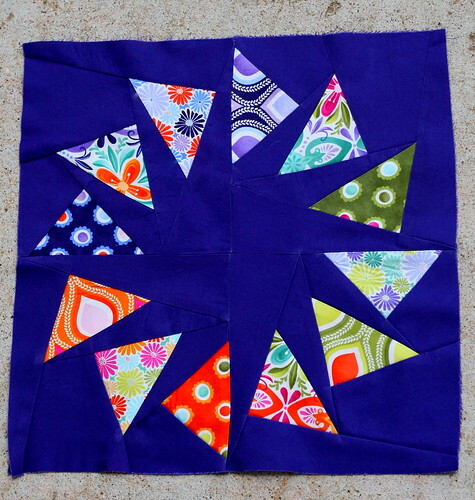 Lee of Freshly Pieced has a tutorial for the Arkansas Traveler block, you can read it here. Please make two blocks, one to swap with other guild members at the April meeting, and one to donate toward a future donation quilt. You can decide to follow one of the tutorials listed or create your own block. Blocks should be 12.5 inches square when finished, and may be made using any colors you choose. I was born in New Mexico but have been in Central Texas since I was two years old. I graduated high school in Pflugerville and received a graphic design degree from Texas State in San Marcos in 2004. I am currently a full time nanny taking care of 18 month old twins. It is reallynice to be able to sew or work on my blog and Etsy shop during their nap time. I am the oldest of three children and I have a huge extended family. My mom has seven siblings, there are 21 first cousins, and a bunch of little first cousins once removed. My family gets together often and we always have lots of fun playing games and eating yummy food. We have instituted a quarterly Cousin's Day; all the first cousins get together to go bowling, go to an Aggie football game, or hang out at Zilker Park all day. When I was in college I got a Brother sewing machine from my mom. My step daughter and I made pajama pants, pillows, a couple of dresses, things like that. Then I didn't sew much for a few years because there was not much room in my apartment to set up a sewing area. 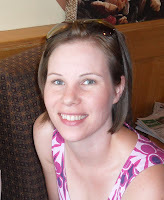 In early 2009 I separated from my (now ex-) husband and found myself with a lot of time on my hands. I lost a lot of friends over the ten year relationship due to my ex-husbands controlling personality, most of my belongings were in storage and I was renting a room from the people I was working for at the time. So I got my sewing machine out of storage, set it up on the floor of the bedroom and sewed a baby blanket from a kit for my friend's new baby. After that I decided to make a quilt for the baby's big sister. My aunt and grandmother on my dad's side of the family both quilt, and my maternal grandma in Rockne is a quilter. I made my first quilt in the fall of 2009 in Fort Worth with my aunt and grandmother. They taught me a lot about construction, fabric, layout and all the steps involved in making a quilt and I haven't been able to stop sewing and quilting ever since! Recently I wrote a post on my blog about this quilt, you can read about it here. esigning quilt tops and shopping for fabric. I like working with color a lot, color theory in college was one of my favorite classes. Before I started quilting on the long arm machine, basting and quilting on my Brother machine was my least favorite. I just wanted it to instantly be a finished quilt without safety pins all over it. Now the least fun part for me is prepping the fabric for a new project. Washing and ironing the fabric and cutting out all the pieces takes a while. I am always eager to get started sewing and begin to see the project come together. I would really love to learn to paper piece. I have seen some intricate and beautiful work that is being done with paper piecing and everyone says it is not a difficult technique. I think it is something I could do and enjoy, I just need to find the time to sit down and try it out. I also want to practice sewing curves, and learn to sew in a zipper so I can make use of a book I got for my birthday, Bags: the Modern Classics by Sue Kim. I always have several projects in progress at the same time. I have a table in my studio that I stack works in progress on and there are a few things that have been there for (*gulp!) several months. I am planning to replace that table with a larger one that can hold my cutting mat so I either need to find a new place for works in progress or finish them all up soon! I do have a large fabric stash. Recently I decided to wash all the fabric and I am still in the process of ironing and folding the fabrics and putting them away. I have two vintage suitcases that I am storing the folded fabric in but it looks like some of it will have to be housed on a shelf in my studio. I also have one basket of fabric scraps, I made a rule that my small scraps can not exceed what fits in that basket. Recently I read about this scrap buster and I love it! I made one block and I plan to make several more. Maybe enough for an entire quilt. I have lots of fabric that was cut on the bias for projects other than quilting and this is a great way to use those without running in to issues. I am in the process of organizing my studio now and moving some things around. I bought a simple plastic set of drawers to house all my notions and that helped to clear up the space around my sewing machine. The suitcases and baskets that hold fabric have been a big help, they allow me to see all of my fabric at once so it is easy to pick out coordinating pieces for new projects. I am also really excited about a table that my cousin is making for me. Right now I have my cutting mat on my kitchen counter which is large and sturdy and great for cutting fabric, but I am excited to move that mat in to my studio and reclaim the living area of my apartment. I am obsessed with fabrics with a food theme. I can't seem to resist vegetables and fruits printed on fabrics. The most recent one I bought is Maude Asbury's Kitchy Kitchen line; I made some pot holders with that. And I love the Ghastlies by Alexander Henry. I bought several yards from that line, but haven't decided what to do with it yet. I have a small pair of Gingher scissors that I use to trim threads and I use them when hand sewing binding down. Once or twice I have misplaced them and that is when I realize that I rely on them quite a bit. I use those scissors everyday and trying to trim threads and clean up my projects is difficult with larger scissors. I have two. The Brother is from Wal-Mart and is about eight years old. I don't use it unless my new machine is in the shop, but it has sentimental value and I am not ready to get rid of it yet. I collected Christmas and birthday money at the end of 2010 and bought a Janome 3160 QDC. I love it! It has tons of embroidery stitches, a table extender, an automatic thread cutter, and lots of other great features. I like to make lots of different things and I sell them at First Thursday each month at Guero's Taco Bar on South Congress. I sell at other local art shows and on Etsy, my shop is Splendid Calm Textiles. I like making purses and bags, I hand sew flowers and add alligator clips that can be worn in the hair or as a brooch. I applique on to kid clothing for easy, hand made gifts for friends and family. I quilt smaller things too like pot holders, table toppers, and picnic blankets. I have made a few fiber wall hangings that I've displayed at coffee shops around Austin and in a few local art galleries. Right now my cousin (Robin Field) and I are working together to make a queen size quilt for her brother, he is in the Navy and currently stationed in Afghanistan. She and I are also making a donation quilt for this year's Relay for Life silent auction event. I am making a hounds tooth quilt for my sister using two blue Kona solids, the pattern is from V and Co. I am making plans and deciding on fabrics for several wedding gifts, so far I have three cousins that are getting married this year. My brother is a member of the Singing Cadets at Texas A&M and I am making an Aggie inspired quilt to donate to the silent auction that is a part of their winter tour. I am also appliqueing team T-shirts for my family's Relay for Life team, sewing a table topper that will be a Christmas gift for my sister, creating inventory for art shows, and making a king size quilt for myself. I have two T-shirt quilt orders that I will start soon and I have been sketching out a design so that I can enter a piece in to the Minimalist Design category at QuiltCon next year. Learning to sew and quilt has been such a rewarding and uplifting experience, I learned to quilt during a very difficult time in my life, and I am so grateful to have made so many new friends that share a passion for this creative outlet. I really enjoy being a member of the Austin Modern Quilt Guild, I learn so much and am inspired by the work of the other members. I know that both my grandma and my grandmother are proud that I have learned to quilt and can continue this craft (although they don't always agree with my modern quilting decisions.) I am so glad that Robin and I share this passion for quilting, we talk about it with each other almost every day. We were close as children and have rekindled our close friendship ever since I taught her to quilt in the summer of 2010. I feel extremely blessed to have a such a wonderful and supportive family and also a wonderful friend in Robin. The second Thursday of the month comes early in March! Join us as we meet at Jessica Sloan's new shop near Burnet and Braker. We will be doing an open show & tell, followed by some announcements and opportunities for you to become more involved in guild activities over the next year. Remember to bring your block swap work, and any remaining blocks for the Relay for Life Charity Quilt. Also, we will be selling the AMQG "Piece Out" t-shirts for $10 cash at the meeting.